According to reports, the internet blackout, which has left 75 million people with only limited access, was caused by a ship that tried to moor off the coast of Egypt in bad weather on Wednesday. Since then phone and internet traffic has been severely reduced across a huge swath of the region, slashed by as much as 70% in countries including India, Egypt and Dubai. The first cable – the Fiber-Optic Link Around the Globe (FLAG) – was cut at 0800 on 30 January, the firm said. A second cable thought to lie alongside it – SEA-ME-WE 4, or the South East Asia-Middle East-West Europe 4 cable – was also split. FLAG is a 28,000km (17,400 mile) long submarine communications cable that links Australia and Japan with Europe via India and the Middle East. 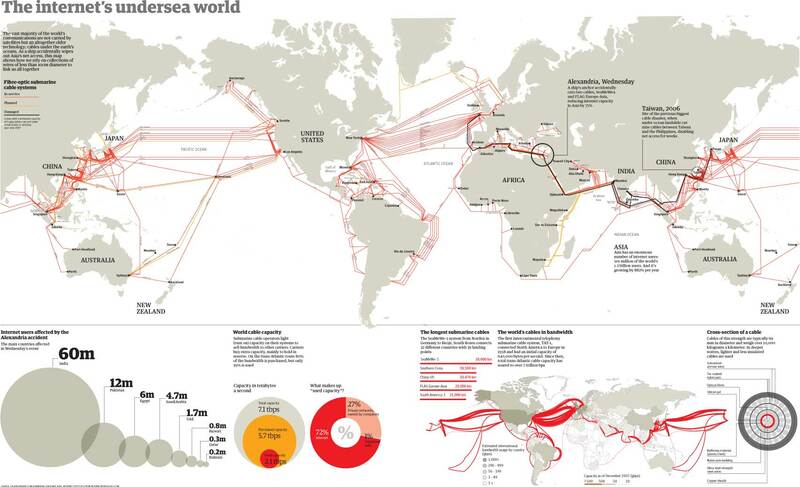 SEA-ME-WE 4 is a submarine cable linking South East Asia to Europe via the Indian subcontinent and the Middle East. The two cable cuts meant that the only cable in service connecting Europe to the Middle East via Egypt was the older Sea-M-We 3 system, according to research firm TeleGeography. The firm said the cuts reduced the amount of available capacity on the stretch of network between India and Europe by 75% percent.